Create an elegant showroom presentation with our Metal Framed Display Cases. 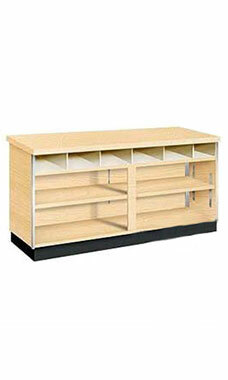 The 70" Maple Service Counter features a multi-purpose design to help retailers provide great customer service. With adjustable rear storage, employees can store tools, supplies, and store essentials right behind the counter, so as to quickly and efficiently serve customers as needed. Finished with a maple melamine laminate finish, the counter adds a sleek modern look to any retail business. Our 34" high counter top surface complies with ADA guidelines. It also has fully finished sturdy 3/4" top, sides, shelves and front lower panel and a recessed black kick-plate. Overall, the maple service counter measures 34"H x 24"D x 70"L. Fully assembled and available for immediate shipping.